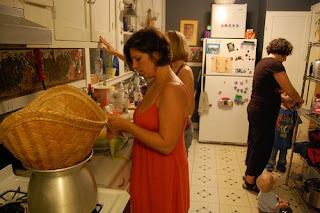 I decided to go ahead and post about tamale making, because all the recipes I found when I was looking were so complicated and time consuming. 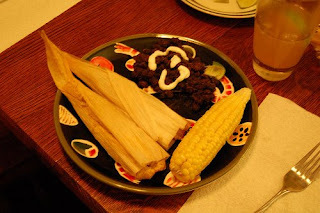 I sort of modified and combined ideas from a few recipes, and drew on my experience with making blue corn lobster tamales at In Limbo back in the day. You will need some type of steamer for this. A basket placed over a pot of boiling water is all that really is. I was lucky enough to have a friend with the perfect setup for tamales, but you could probably improvise with a flat-bottomed basket with 4-6 inch sides placed over a large pot or dutch oven. You can see the setup I used here. You can find dried corn husks and Masa (the cornmeal-based flour for the tamale "crust") at most supermarkets in the Mexican section. If you don't have a pressure cooker (you really should get one), you'll need to plan ahead a little and cook the meat in a crock pot with enough liquid to cover. Place meat in pressure cooker/crock pot with plenty of water (pressure cookers can't be more than about half full, but they produce a concentrated broth that you can add water to afterwards), 2 dried chiles, garlic, about a tsp each salt and black pepper, 1/2 tsp red pepper (more if you want them spicier), a tsp or so each of chili powder and cumin. Cook until meat is very tender and falling apart. Remove meat to a cutting board, reserving broth, and chop very fine. Keep in the onion and garlic but remove the dried chiles. You can do this part up to three days ahead and stick the meat and broth in the fridge until you're ready to assemble. Put the corn husks in a large bowl of water to soak and set aside. Pour about half the Masa (2 of the 4 lbs) in a large bowl. Slowly add warm broth and work in with your hands until mixture reaches a peanutbutter-like consistency. Remove corn husks from water, separate and pat dry-ish. Set up your assembly line of ingredients so that you can easily make the tamales. Grab a husk, spread it with about a half-inch thickness of prepared masa, leaving about an inch down the right side uncovered. Place a line of chopped meat down the length sort of left of center, then roll up so the uncovered edge of husk makes the outer edge. Fold the long pointy end over like and envelope, and place on end (standing up) in basket. Continue until you run out of all or one of the components. Now, I kept finding recipes that said the tamales need to steam for two hours, but I knew we didn't cook them that long at the restaurant. I eventually found a chef's recipe for more fussily filled tamales that said steam for 30 minutes, so I went with that cook time and it worked fine. maybe the longer time is necessary for larger batches? Anyway, bring your pot of water to a rolling boil, put your tamale-filled basket on top of it, and cover the basket with some kind of lid. It doesn't have to be airtight--I just sort of dropped the lid to my dutch oven on top of the tamales. If you're using a large flat basket, a cookie sheet or something might work as a lid. Cook until done, and enjoy! I served mine with steamed a pot of black beans, fresh corn, fresh avocado salad, and my favorite salsa. A lot of people like chili over theirs, with shredded cheese and chopped onion. Or you can keep it simple with a little Cholula or Frank's Red Hot.